A bevy of Nevada Politicians have joined forces with the Raiders’ owner, Mark Davis, an d president Marc Badain to create a promotional video promoting the building of a new stadium in Las Vegas. 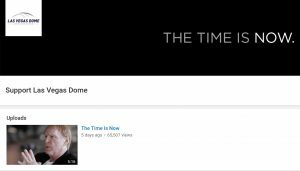 The promotional video has been posted on YouTubve by a group calling themselves the “Support Las Vegas Dome” group. Next Next post: Ronnie Lott consortium to Scupper vegas Move?